Mistreatment of the social care workforce is threatening the sustainability of the entire adult social care system in England. Low wages, lack of training, insecure contracts and exhausting hours are just some of the features which have come to define care work. If we are to recruit and retain the workers we need to meet rapidly rising demand, we need to ensure fair pay and decent conditions for them. Local authorities – who commission most social care in England – have been hit hard by austerity. Government funding for them has been cut in half since 2010, leaving many struggling to meet the cost of rising demand for social care. Private firms are being asked to deliver more and more with less and less. This has resulted in a race to the bottom, with wages and working conditions undercut by providers in order to secure contracts being let at unrealistically low levels. It is also leading to endemic low pay and poor conditions for the workforce. Almost half of all care workers are paid below the real Living Wage. A quarter of workers in the sector are on zero-hour contracts. Half of all care workers have no relevant social care qualifications, and opportunities for progression are severely limited. As a result, the care sector has proven unattractive to potential new recruits, and retaining workers has become increasingly challenging. In 2018, there were over 100,000 vacancies. New IPPR analysis published this week shows this is set to worsen considerably over the next decade. On the current trend, there will be 350,000 unfilled vacancies in social care by 2028. If we see stricter immigration rules after Brexit, this could rise to 400,000. Fair pay and decent working conditions are important in and of themselves. But fair treatment for care workers is also important for the recipients. High-quality work and high-quality care are inextricably linked. Exhausted care workers forced to take on additional hours to make ends meet will struggle to meet the needs of those they care for. 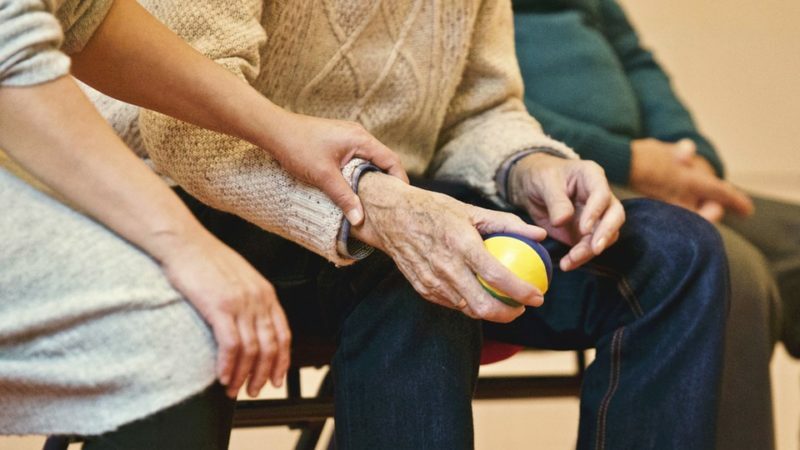 High turnover rates make it impossible for them to form close bonds with those they care for, which is essential for delivering personalised care. Care workers – primarily women – have been left to deal with the burden of underfunding on their own. Fragmented and isolated, with limited union membership, they have lacked the bargaining power to improve their pay and working conditions. This must change. IPPR has called for the introduction of the real Living Wage – the amount calculated according to the cost of living – in the social care sector. This would mean a pay-rise for over 500,000 low-paid care workers, averaging over £1,000 each. It is hardly extravagant to ensure that someone providing a crucial public service should have enough money to buy essentials at the end of their working day. Beyond this, we need to see sectoral collective bargaining in social care provision. This would involve representatives of the workforce, employers and government getting together to establish reasonable minimum conditions for pay, training and working conditions. This would also prevent competition from driving down pay and conditions in the care sector; it would mean employers who treat their staff fairly are not undercut by the rest; and it would ensure providers are able to recruit and retain the workers they need. Sectoral collective bargaining should be a condition on the additional funding the sector needs. Of course, it would come at a cost. We estimate that introducing the real Living Wage would require an additional £445m in England. This will require additional small increases in taxation, and IPPR has called for an increase in National Insurance of 1p in the pound. Social care can no longer be delivered on the premise that the workforce must endure low pay, insecurity and poor conditions. We must take the necessary steps now to provide a better deal for the workforce or risk undermining the social care system entirely through severe workforce shortages. A new funding settlement and sectoral collective bargaining will help make this a reality so that social care workers can enjoy the benefits of a rewarding and satisfying career, while delivering the best possible care to those who need it. Dean Hochlaf is a Researcher at IPPR.